Just a small project I wanted to try. Purple heart and paduk. It’s about the size of a quarter. Thanks for checking it out. That’s two amaizinig types of woods with incredible colours. Beautiful work! I really like the idea. Wonder what a large one, say…8” would look like mounted on a wall? This is a nice creative piece. Nice way to use those smaller pieces! Wow! What did you use for the stitching? Thanks everyone. I just used some wire I had laying around. 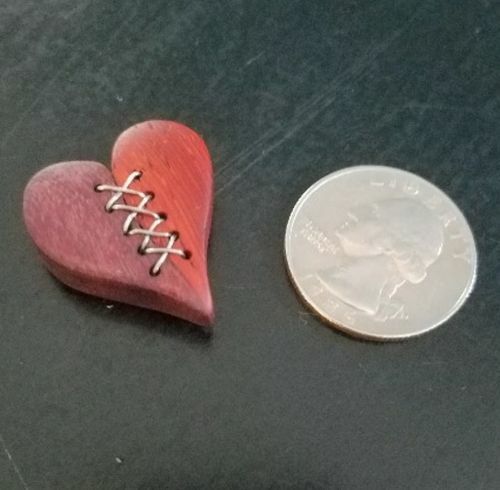 Here is a size comparison. .
My original plan was to used it for a necklace or jewelry related. That’s why it’s so small. I think I’ll make it a necklace for my wife.